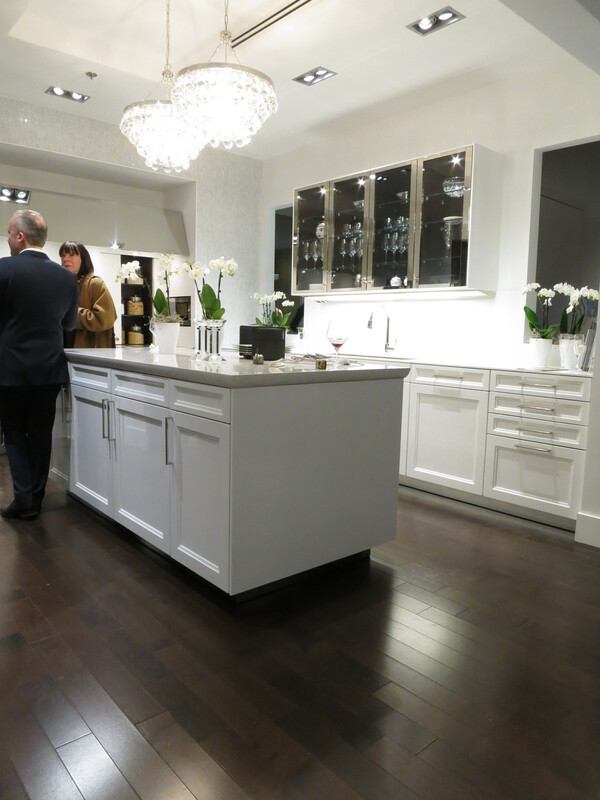 I attended the SieMatic Montreal opening party last night, enjoying cocktails and fantastic hor d’oeuvres with 150 guests in the sparkling new installation. 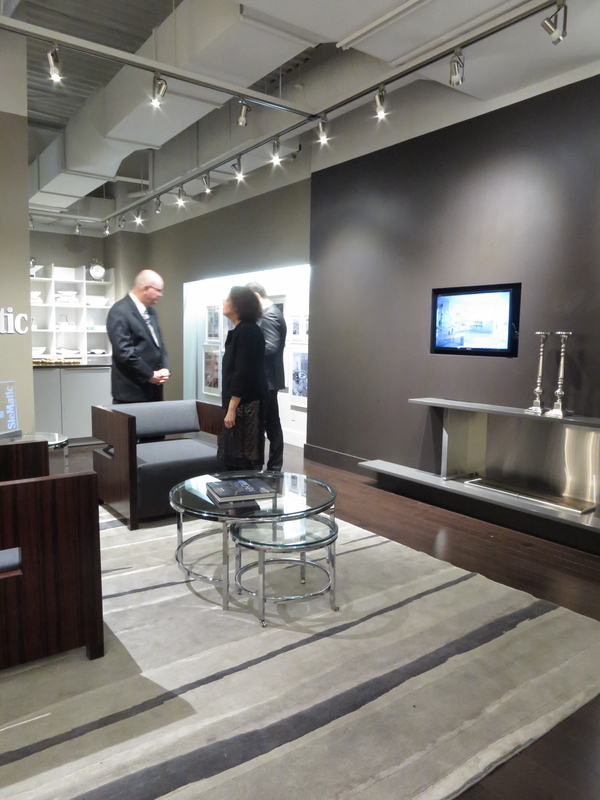 I started working with showroom manager Jean-Martin Lapointe on the design last summer, so it was great to see the space come alive, exactly as we intended. 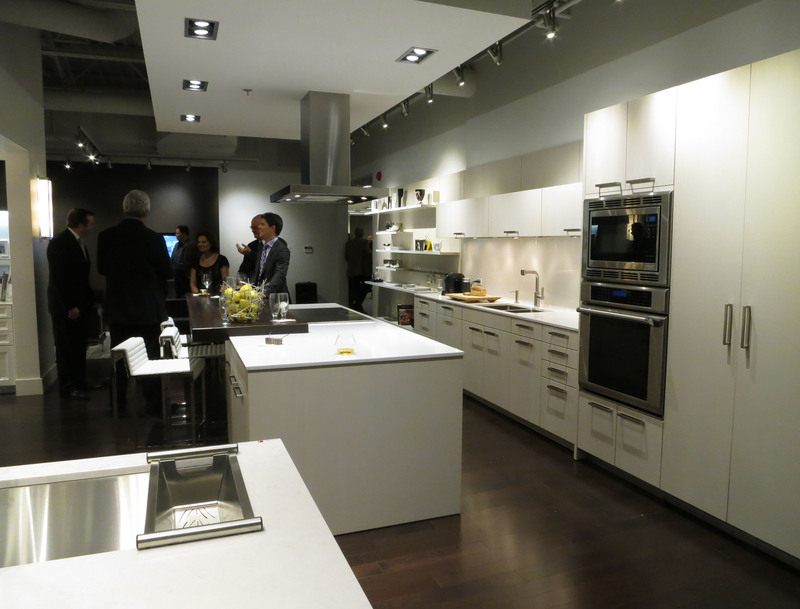 The studio is part of the large kitchen gadget/commercial supplier shop Doyon Cuisine, in the upscale Montreal suburb of Brossard. 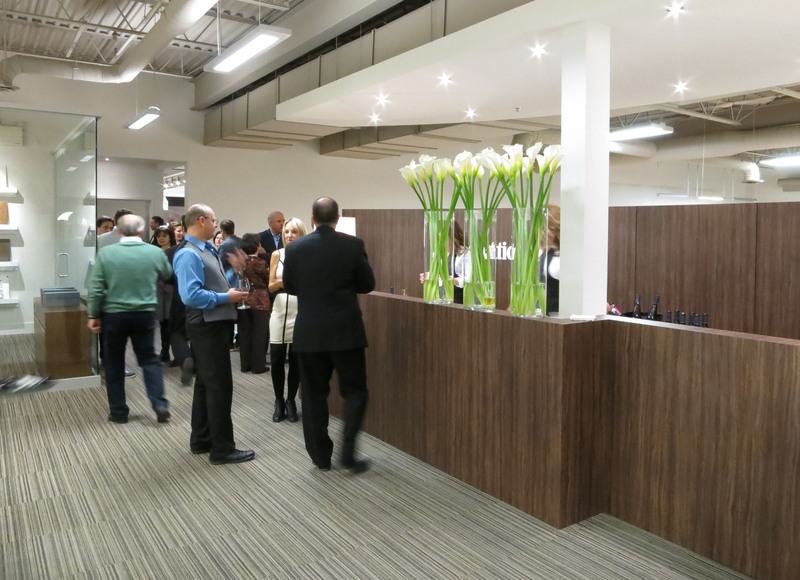 To enter the space, one goes through the main kitchen store and up the stairs to SieMatic. We clad the stair area with a walnut laminate to visually connect the SieMatic areas upstairs. 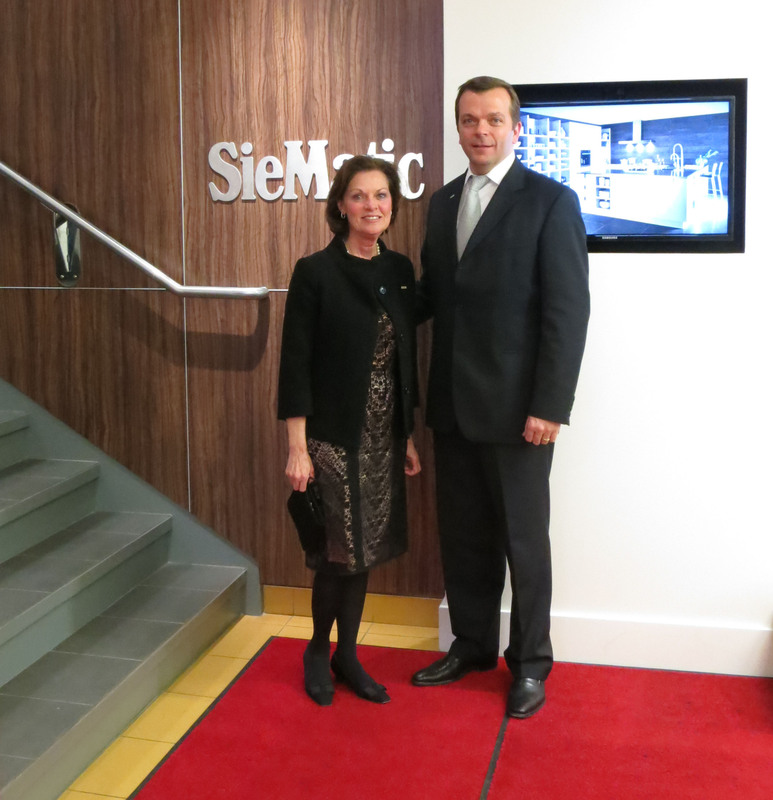 Here SieMatic USA principal management Marcia Speer and Hans Henkes pose on the red carpet. When reaching the top of the stairs, we needed to show visitors the way to the studio (to the left at top of stairs. We added a walnut laminate-clad desk and curved wall at the top of the mezzanine and used logos to denote the way to the main showroom. This area is the perfect buffet and bar area for events. 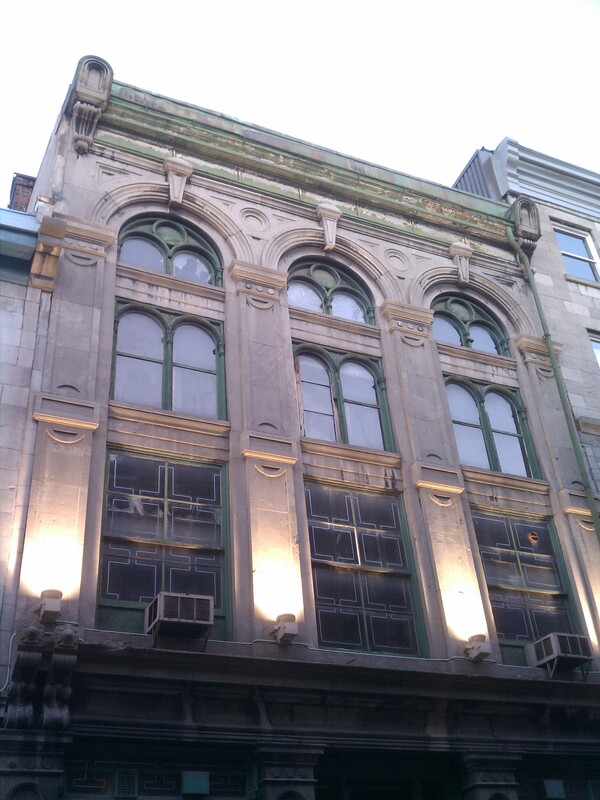 The ceiling of the Doyon Cuisine space was a lovely terracotta color, and walls apple green. Jean-Martin and I selected all new finishes for the building and carefully orchestrated the entrance sequence, as the studio itself passes by the commercial demonstration kitchen before entering the displays. Upon entry, one walks into a “full living environment”-style display – showing a living space with a large kitchen display. 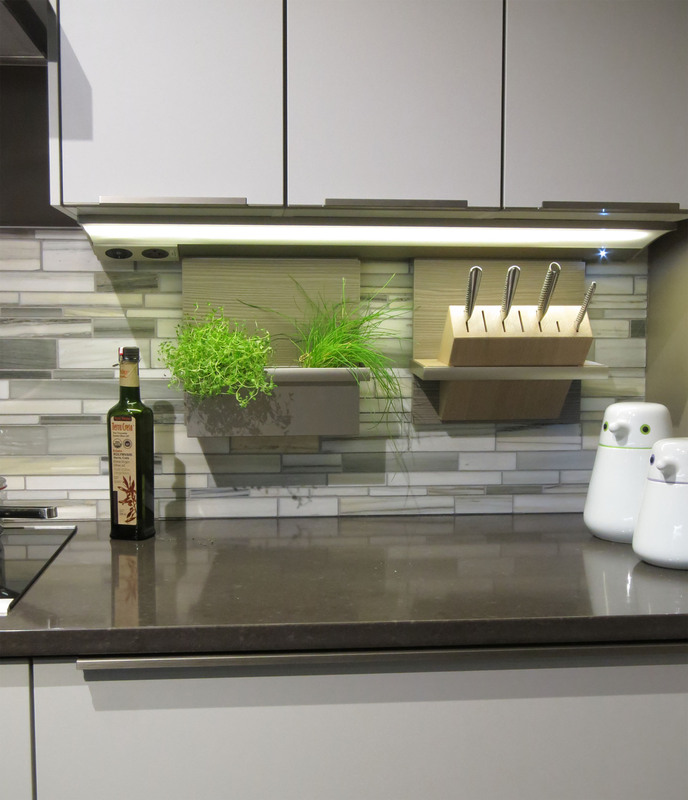 The first kitchen display is an SE4004 Stone Beech Veneer. This display bridges the living space with Floating Spaces shelving to integrate a flexible storage element which can be more decorative or more functional, depending on planning and configuration. Note the ceiling “cloud” above to bring the scale down and slightly mask the commercial corrugated/exposed ceiling. 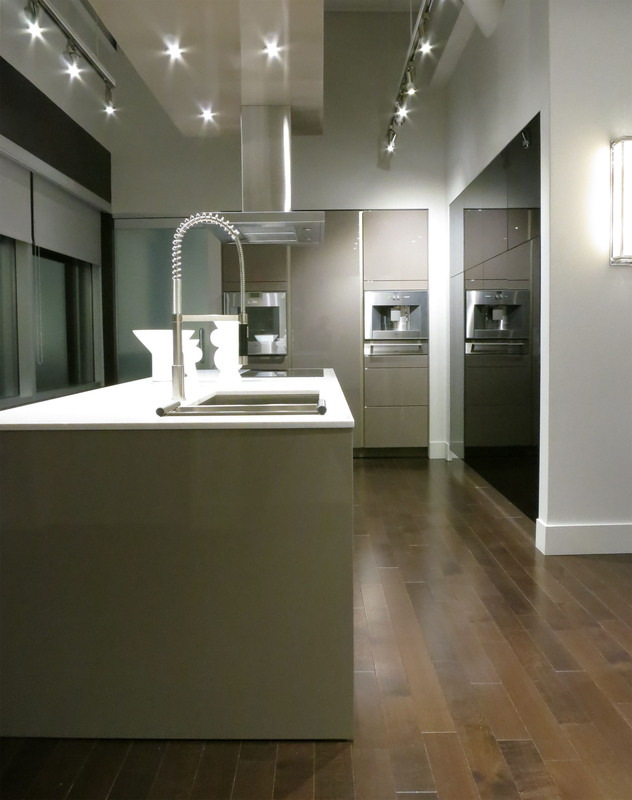 The flooring throughout is a dark medium-plank veneer. 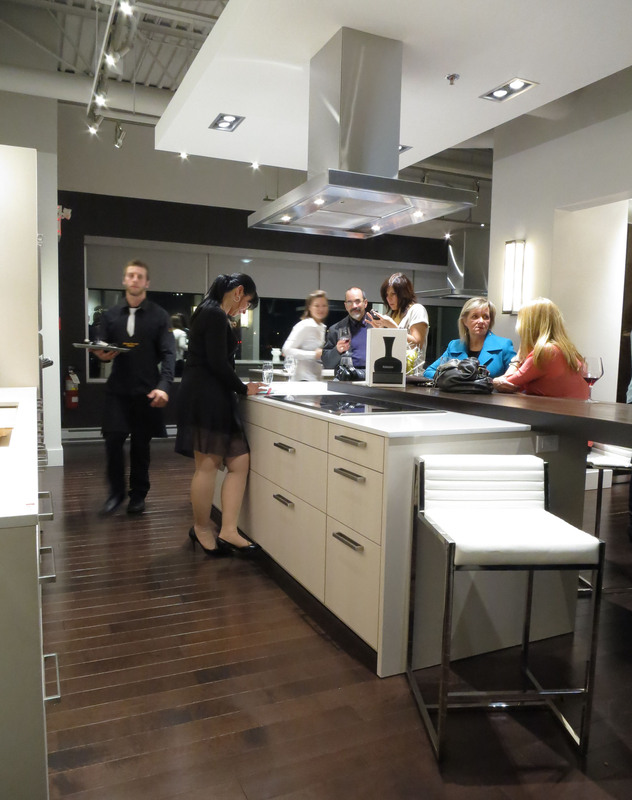 Mick enjoying a drink with guests and SieMatic management/colleagues at the cantilevered Smoked Oak countertop. 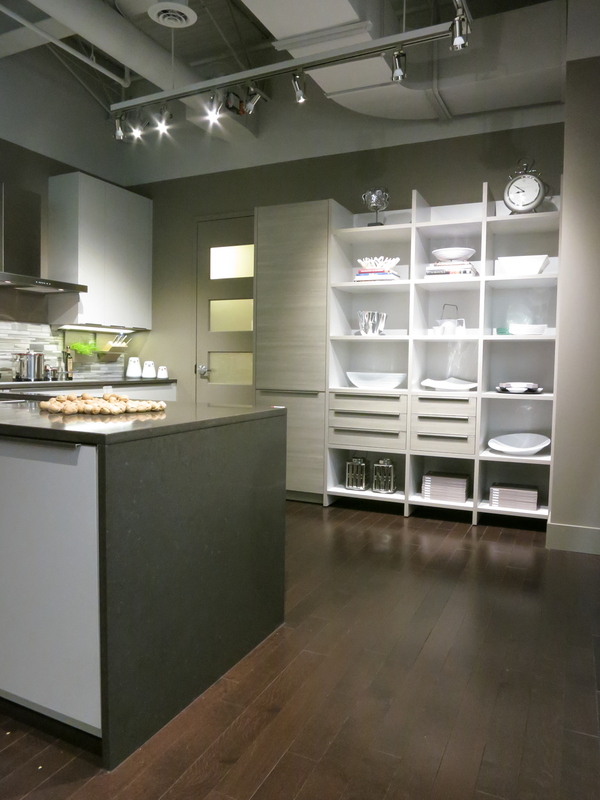 The display around the corner is an S2-L Truffle Grey Gloss Lacquer model with black glass touch-latch cabinets embedded in the wall to the right. The vertical channel tall cabinets hide a column-style Gaggenau refrigerator. 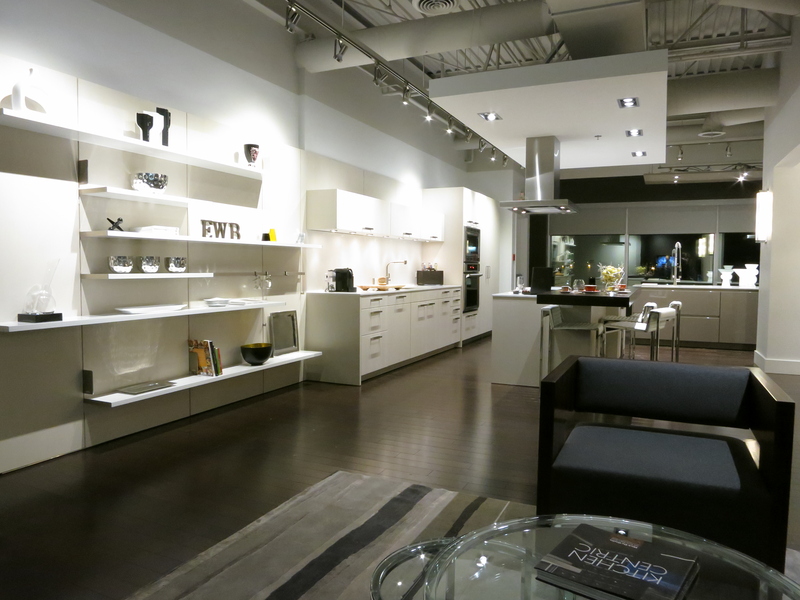 At the center of the showroom is a Beaux Arts 2.0 display, in the “Sophia Loren” style. For more on this style of display search for “Beaux Arts” or “Sophia Loren” here on my blog. 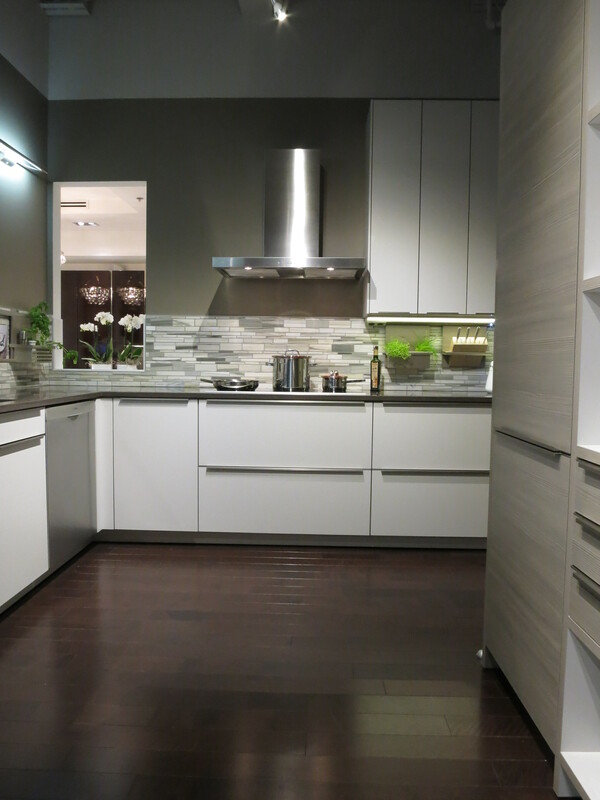 The last display is an SC10 in Titan Pine and Sterling Grey laminate. This is a Smart Design offering from SieMatic, which is a great look at a popular price-point. We show Materials system shelves along with a standard L-shape design. Here is a view of the samples library/consultation room, just adjacent to the studio entrance and across from the reception area. 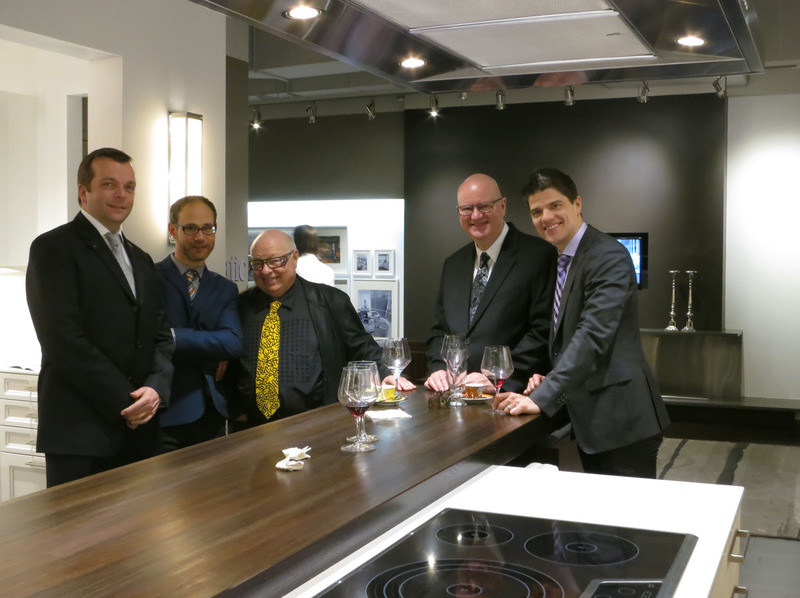 SieMatic Montreal is associated with Doyon Cuisine and Julien, the fantastic stainless fixtures company. 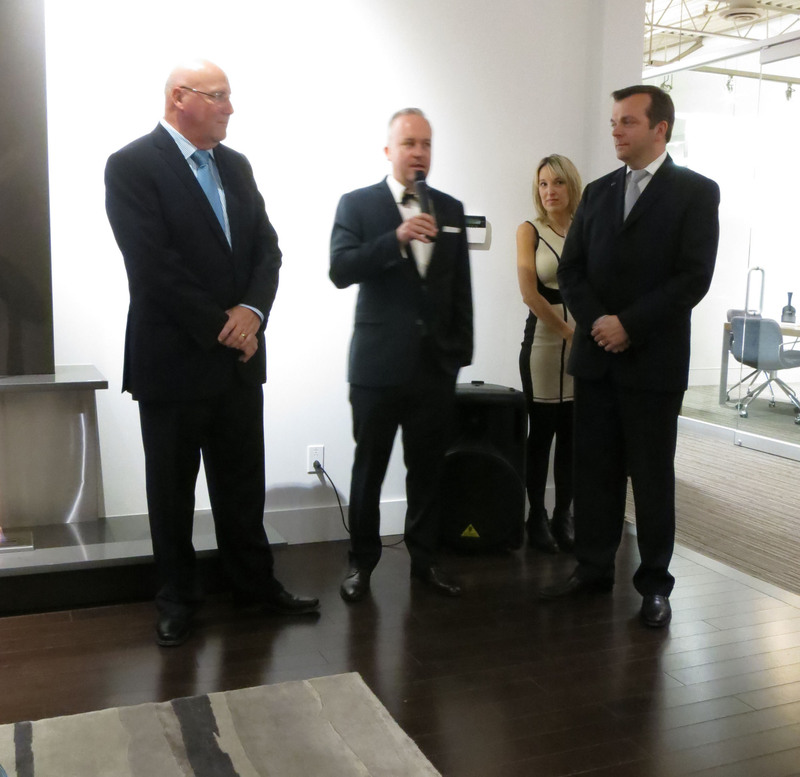 Here, Jean-Martin Lapointe addresses the guests along with Hans Henkes and Julien CEO Gilles St-Pierre. 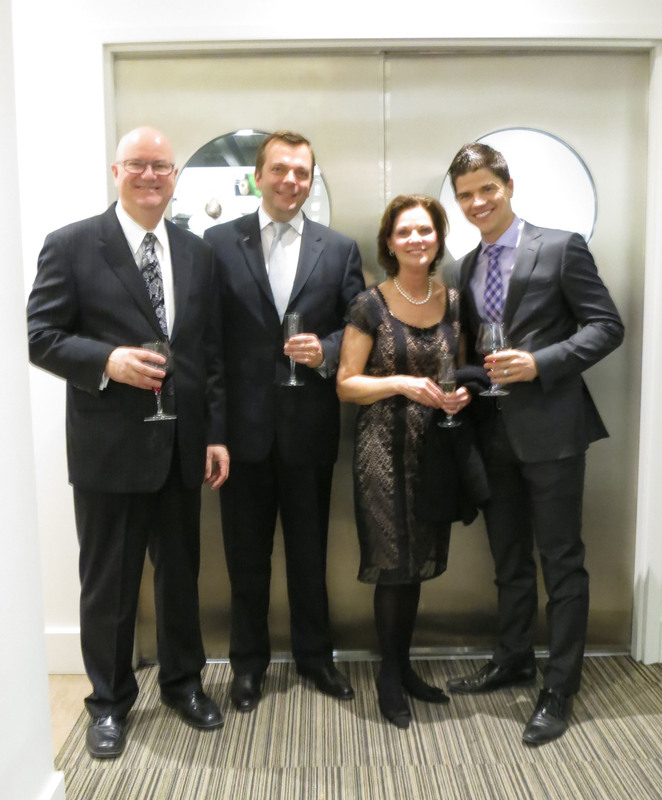 A parting shot – old friends Keith and Raymond Binns (SieMatic resellers in Toronto) with SieMatic management. I am very happy with the final presentation. Jean-Martin Lapointe did a fantastic job at executing the design, and this business is surely going to do quite well here in Montreal. As always, I wish I had more time to spend in the city, but I have pledged to come back in the summer or fall – with my bicycles and sense of weekend adventure – and visit again. 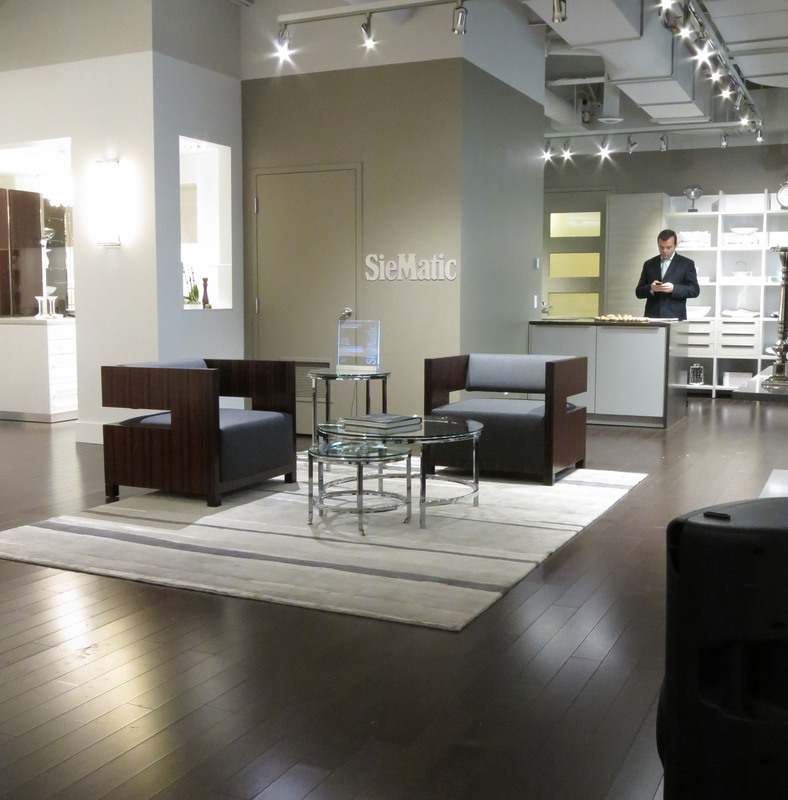 I received my invitation to the SieMatic Montreal showroom opening today. 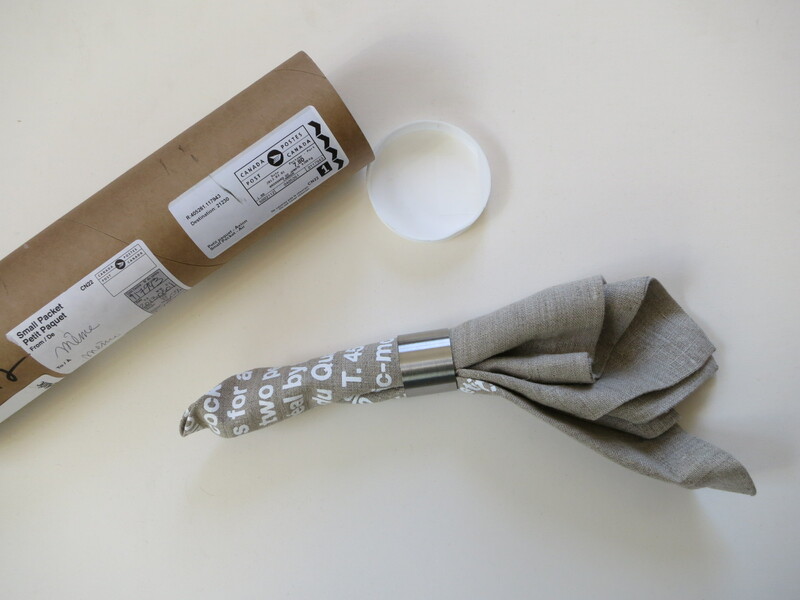 I was not expecting any mail coming in a tube… then I saw the Canada Post label. Upon opening, what a surprise! The invitation is screened onto a nice linen dinner napkin. Mailed invitations are a rarity these days, which makes this creative gesture all the more exciting. I most certainly plan to attend, and hopefully I can come back with some good photos of our work. I was talking with the manager this past weekend and things have come together nicely after some minor construction jitters. 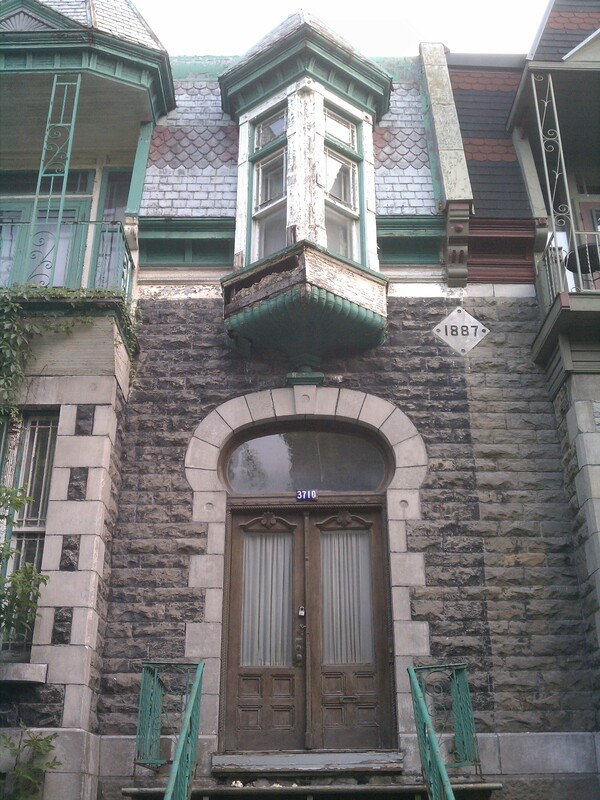 Stay tuned for more from Montreal later in the month. The sense of scale is just about perfect. The adjacent streets have the best residential width (parking on each side and one driving lane), with the houses the correct height for the width. The street trees and small gardens in front were generally very well maintained and creatively planted. I love the variety. 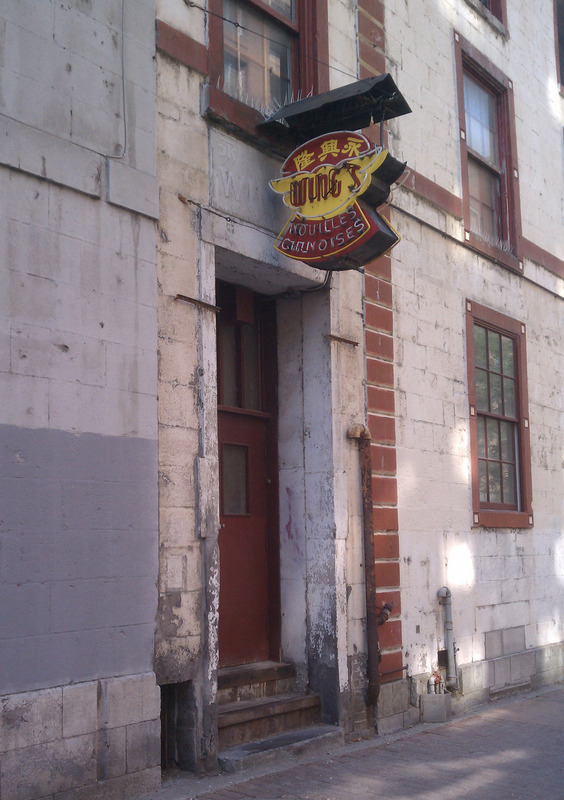 The New Urbanists must love this place – I certainly do. 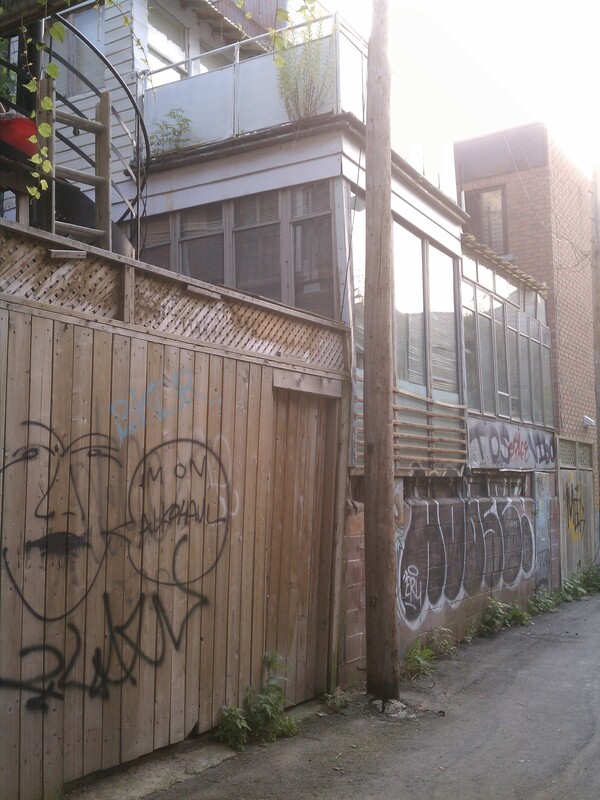 As I walked around this place, I was reminded of the book City Life by my favorite urbanist/writer Witold Rybczynski. At the beginning of the book the author describes a fellow-Montrealer’s remarks about visiting Paris; “why can’t our cities be like that?” There is no short answer; the author works on this question for hundreds of pages of lovely prose. 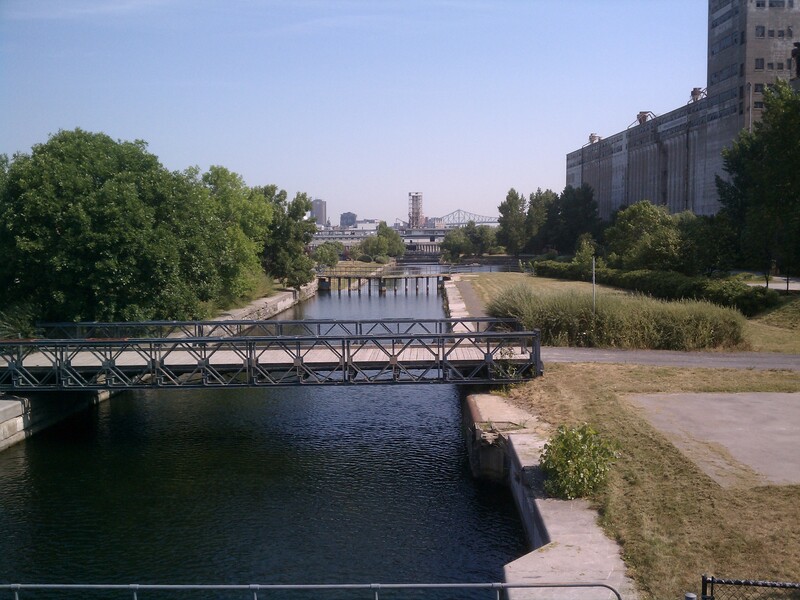 Ironically, however, I find Montreal to be quite beautiful, compared to other say, more industrial North American cities. This neighborhood is not unlike several in Baltimore, in which I live. I’ll have to do a few studies of Bolton Hill, Reservoir Hill… the sense of scale, grandeur and detailing is very similar. 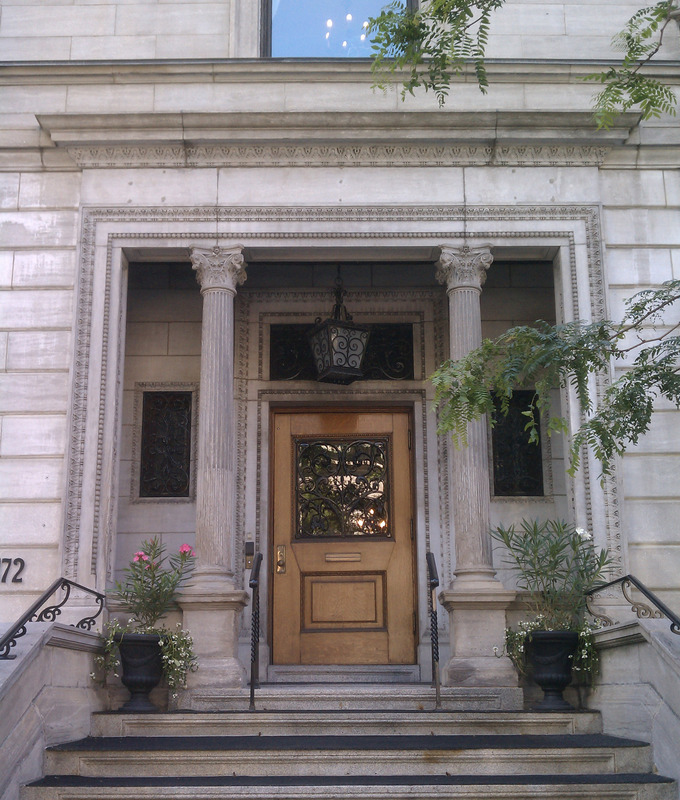 The ironwork and stonework is remarkably close. Also, the street layout is similar using the alley systems, which is my favorite feature of North American cities (well, those which preserved the alleys). I walked around back too… the houses push right up against the rear fence. 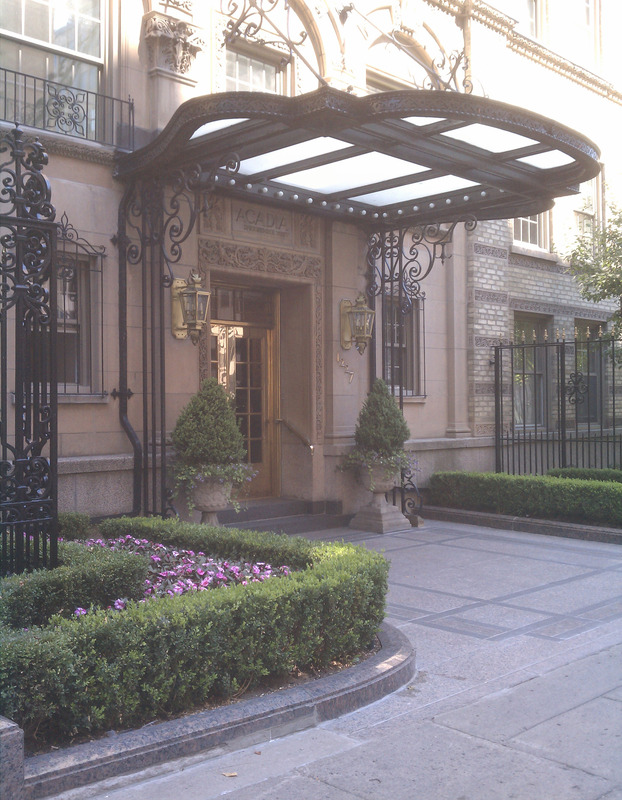 Now we see the significance of those front balconies and gardens. 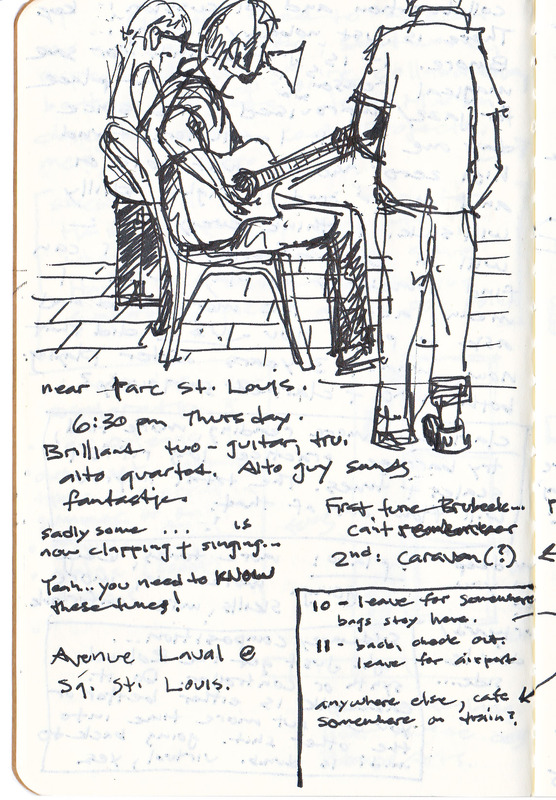 Overall, this neighborhood had a calmness and scale that was at once both invigorating and relaxing. This theme crops up a lot in my urban walks – and I think much of it has to do with the lack of automobiles, the presence of trees and the variety of building style. 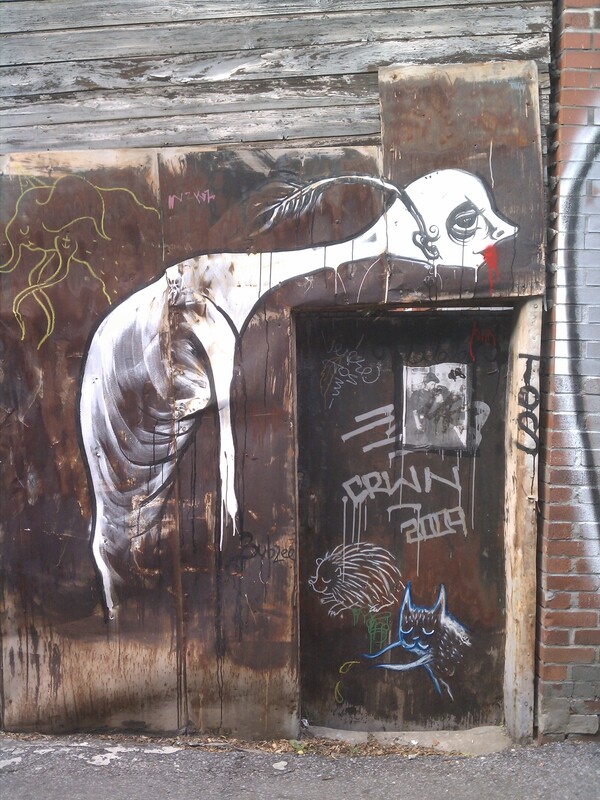 I’ll close with a random picture from Chinatown in Montreal. Lovely city, I do hope to get back for our project’s completion. 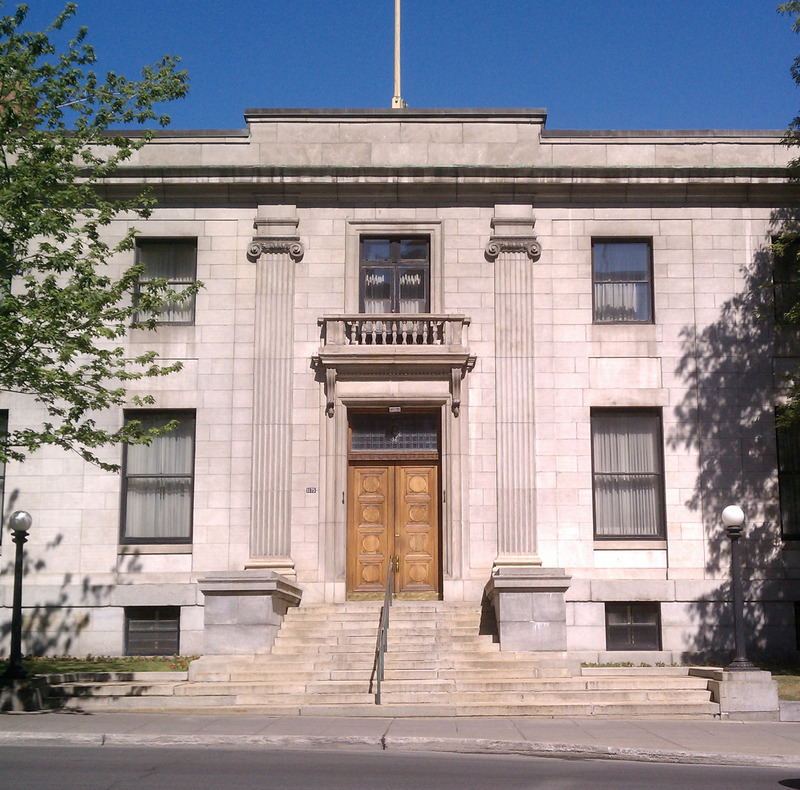 Continuing my walk around Montreal, here is a quick tour of the Golden Square Mile, the “uptown” area developed in the Gilded Age. So named because of the large residences and prominent office buildings/shopping destinations, the area still has a manicured, refined feel. 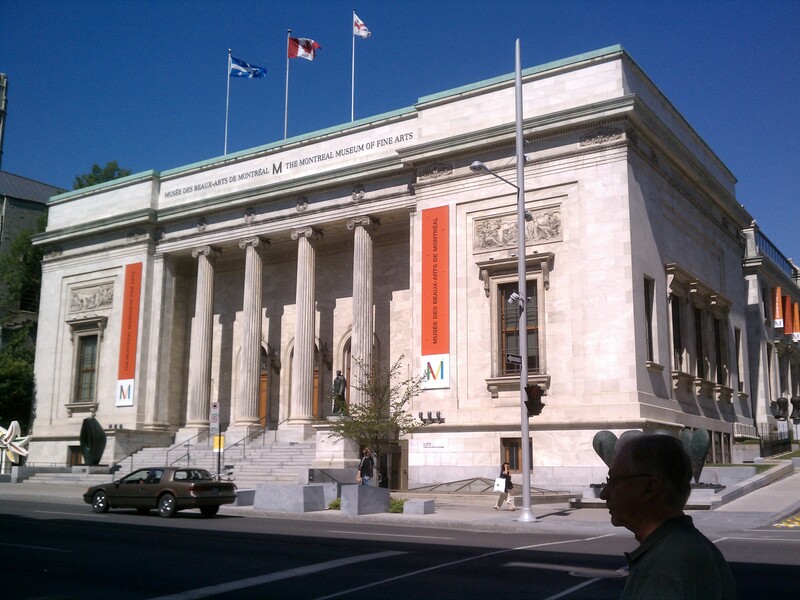 The fine arts museum anchors Sherbrooke Street with a lovely 1912 Beaux Arts structure. 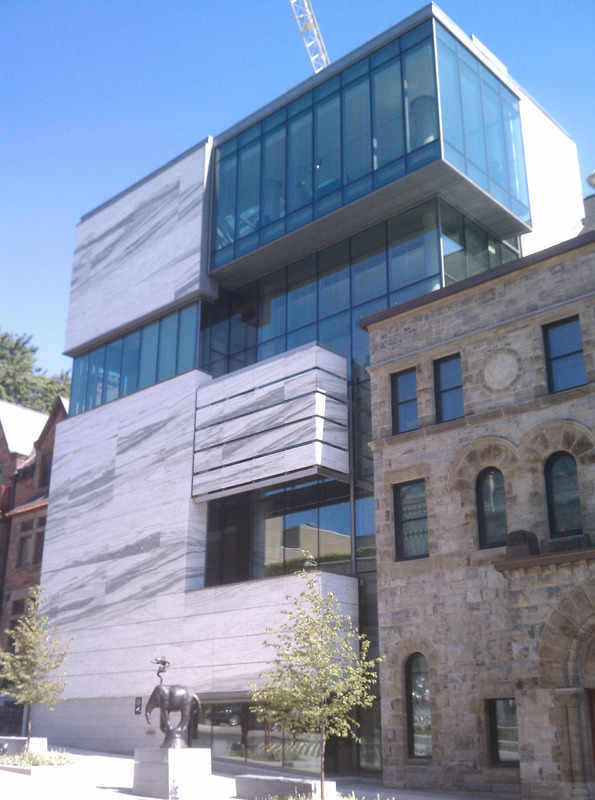 Across the street is a modern museum structure by Moshe Safdie, which does look a little out of place. I didn’t scrutinize it, mostly because the morning sun was coming from right behind it. 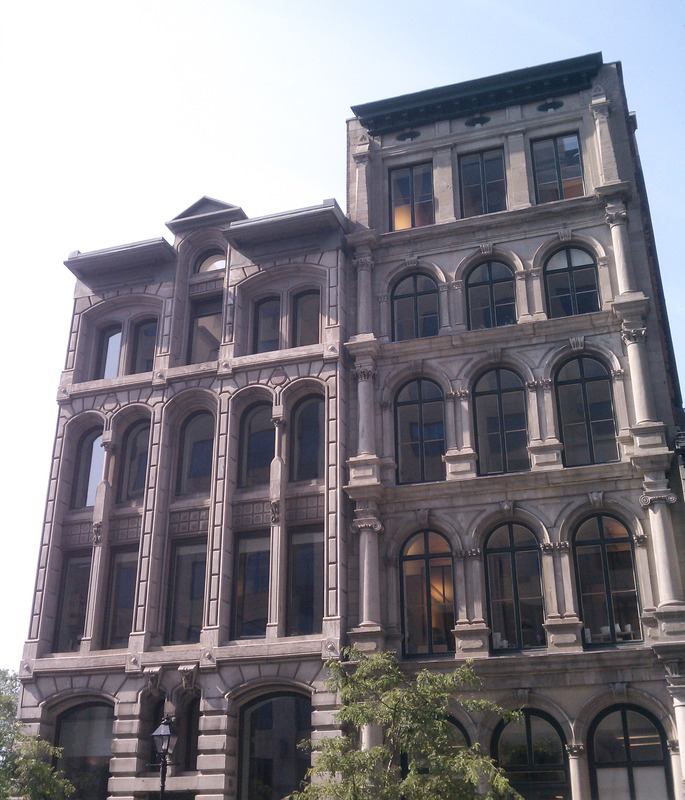 However, Montreal does not seem shy about contrasting new with old, as this adjacent structure illustrates. I walked right up to that nook between old and new; the glass mullions are pressed right up against the old stone. Its a nice detail. 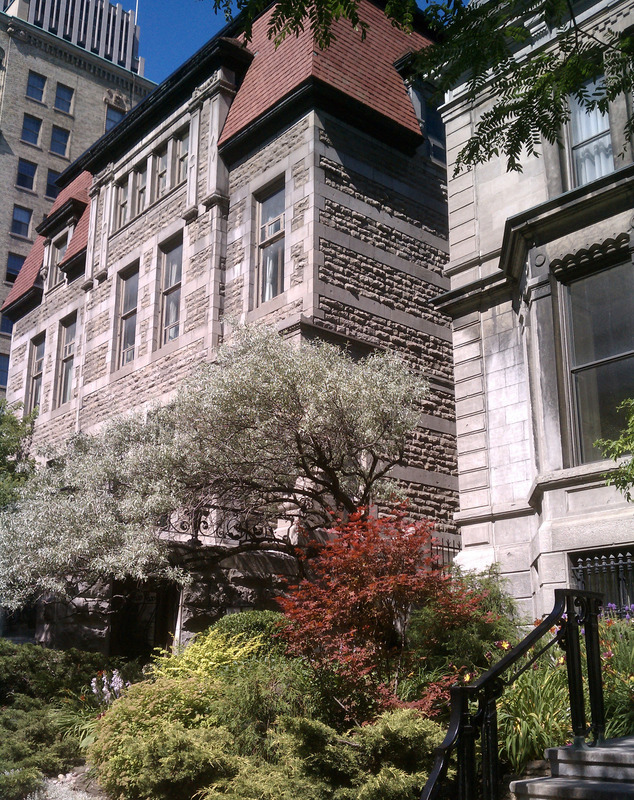 There was a lovely pair of buildings further down the block with some exceptional landscaping in front. 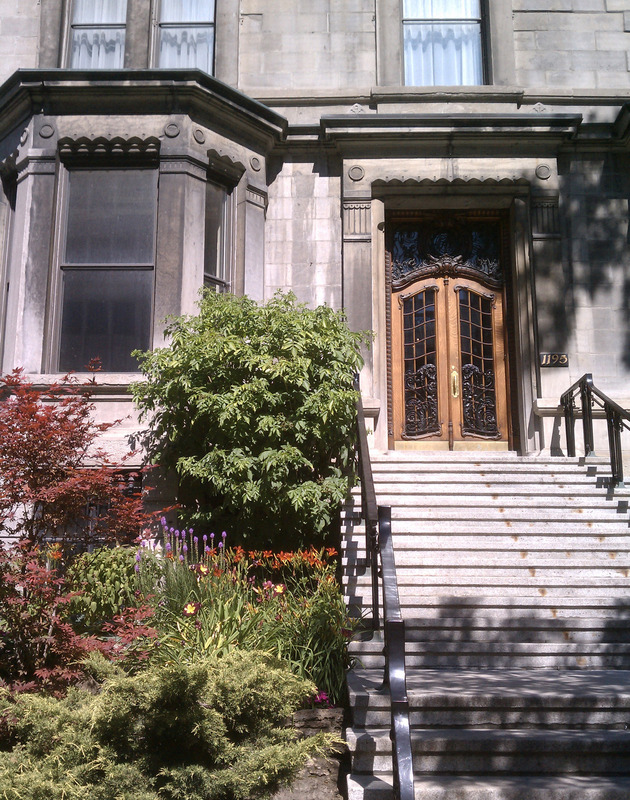 Overall, the street plantings in MTL were quite good. I imagine winter must be pretty bleak but it does look great in the summer. 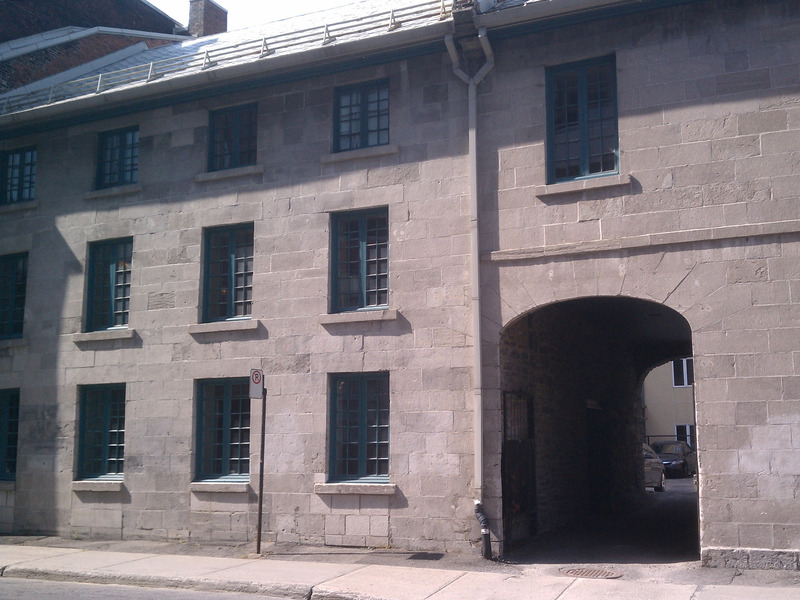 The building to the left was on the corner, and I walked around and checked out the courtyard and carriage house. 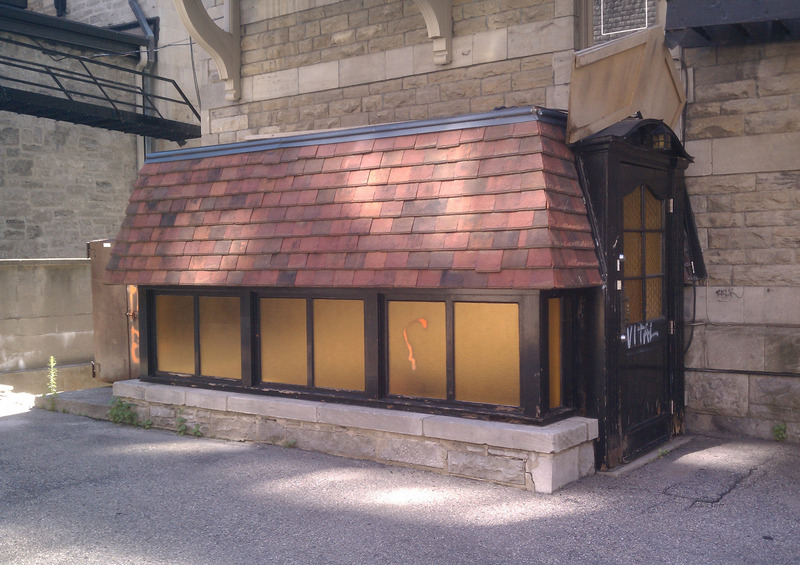 This funny little “guardhouse” structure was tacked on to the back of the main structure. 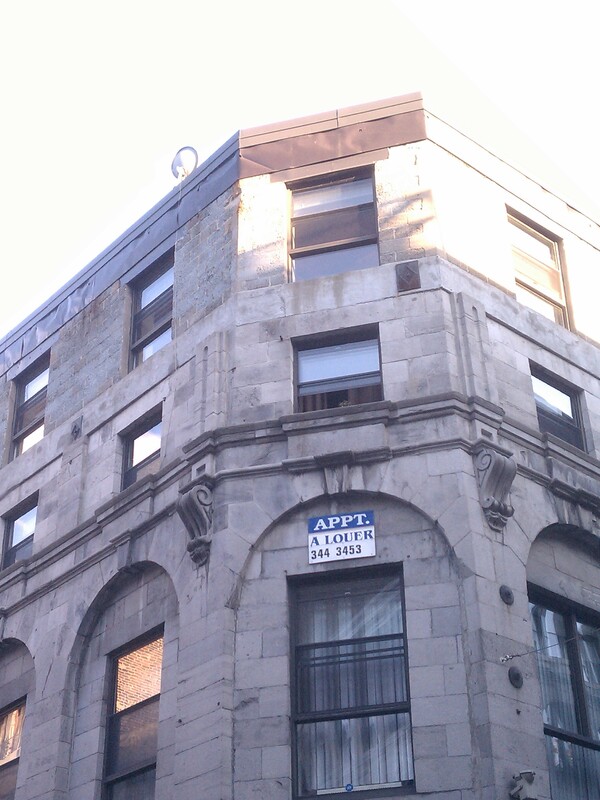 It looks like a roof that was added above the basement stairs… very odd for such a sober, historical structure. 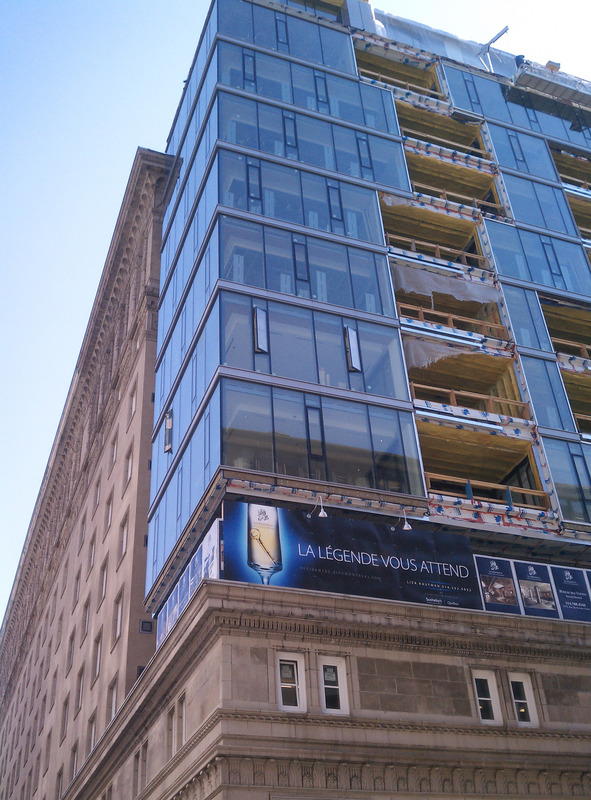 Continuing the juxtaposition of old and new, the Ritz Carlton hotel is adding a shockingly-modern glass structure to their old building. 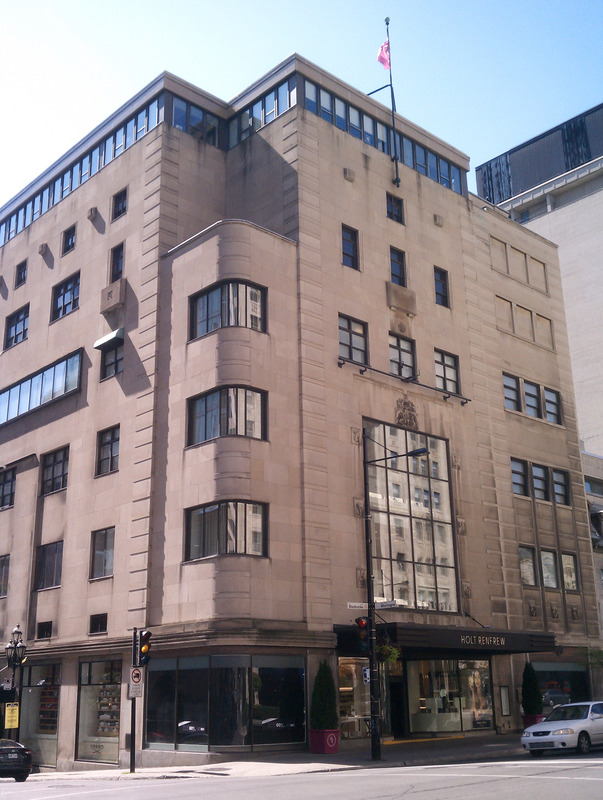 Next door was the Streamline Modern Holt Renfrew department store. This seemed to be the haute shopping corridor of MTL, with Coach, Prada and the like on these several blocks. 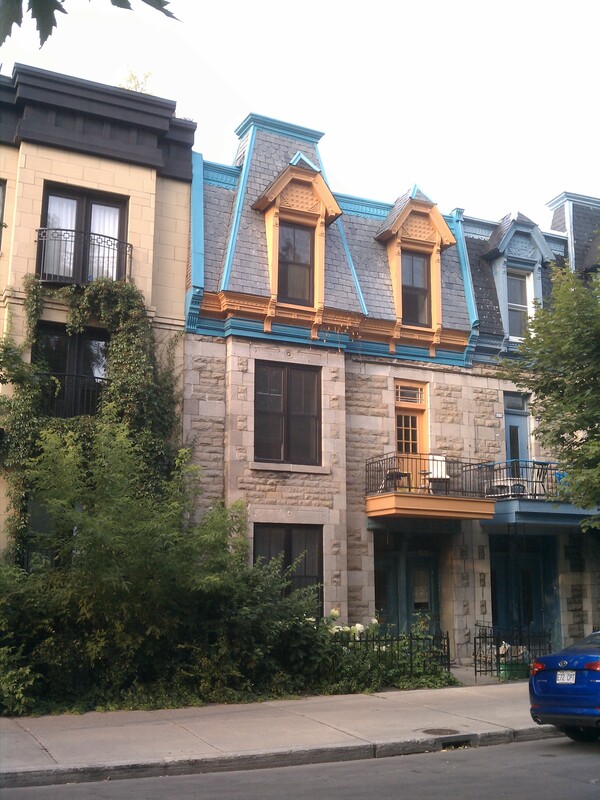 Behind this neighborhood is a long set of stairs which leads to the entrance of Parc du Mont Royal – the small mountain in the center of the city-island. 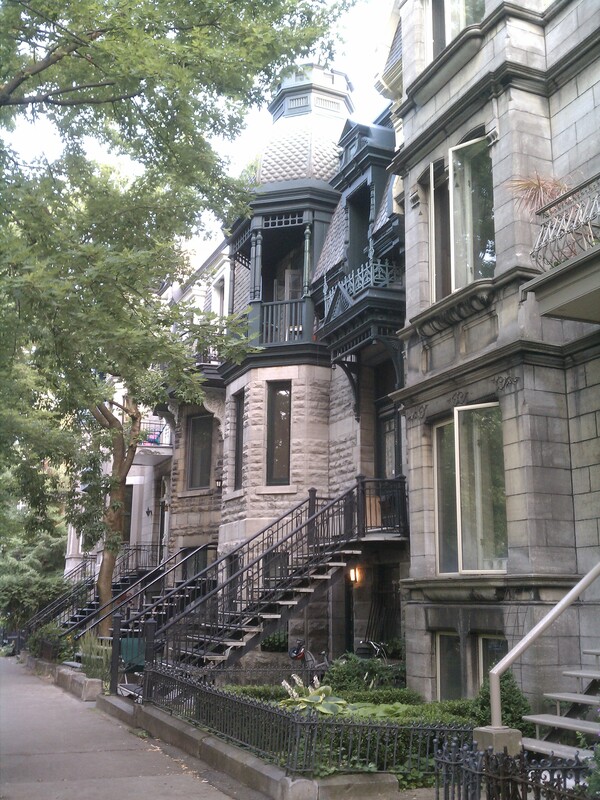 If you have been reading my posts on urban walks, you know I love hilly cities. 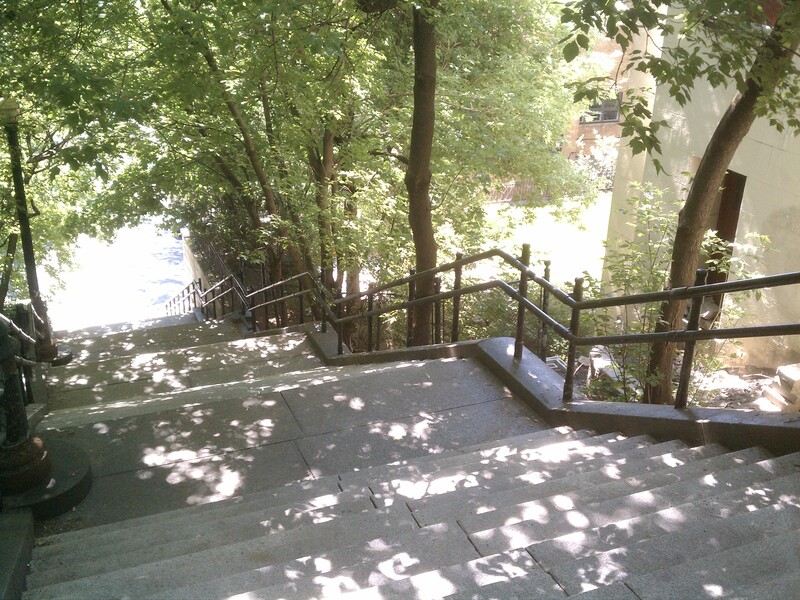 Walking up these shaded stairs was a great treat in the middle of summer. Everything was very clean, no litter or signs of danger. The promise of a huge urban park awaits my ascent. 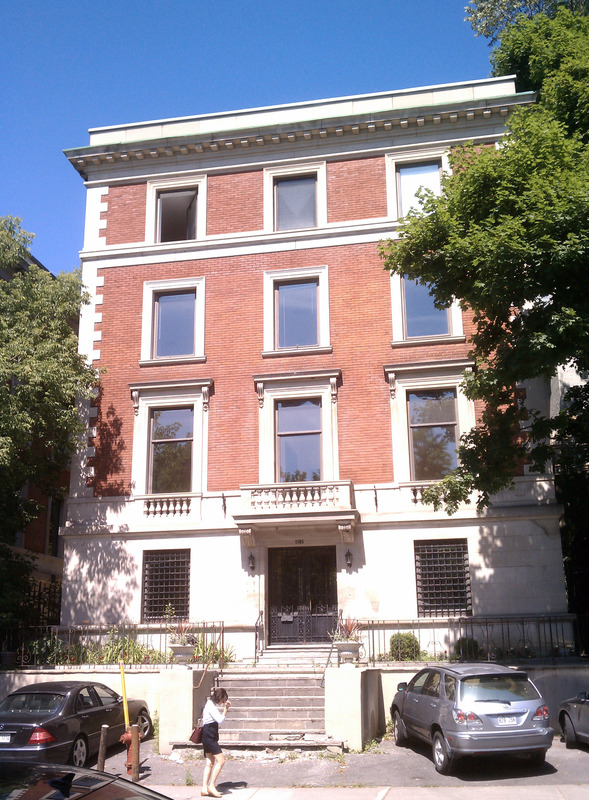 There were some grand apartment houses at the base of the park, which is also the edge of McGill University campus. Overall however, the park was a bit disappointing. It didn’t seem all that “wild”, and there were no other designed-in views or features to get excited about. I took to the single-track walking trails through the forested parts, but they very quickly led right back to main carriage paths. I only found one interesting bridge feature, but even that was not up to the usual FLO/Vaux quality. 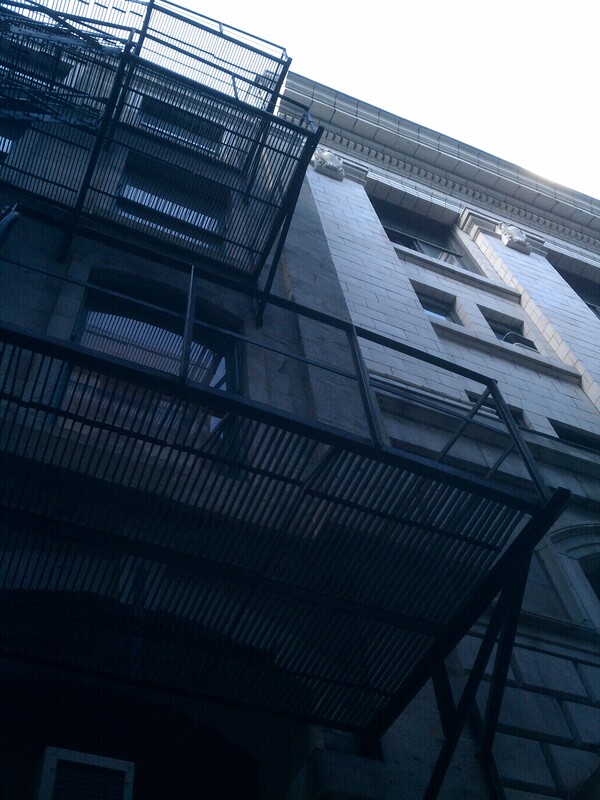 So, I descended the long stairs and went back to the city. I was going to try the Bixi bike rental, but the kiosk I approached was not taking my credit card, so I jumped on the subway. Built in 1967 (the pinnacle of MTL, the year of the big Expo), it is very clean and the cars run on rubber tires, just like Paris. 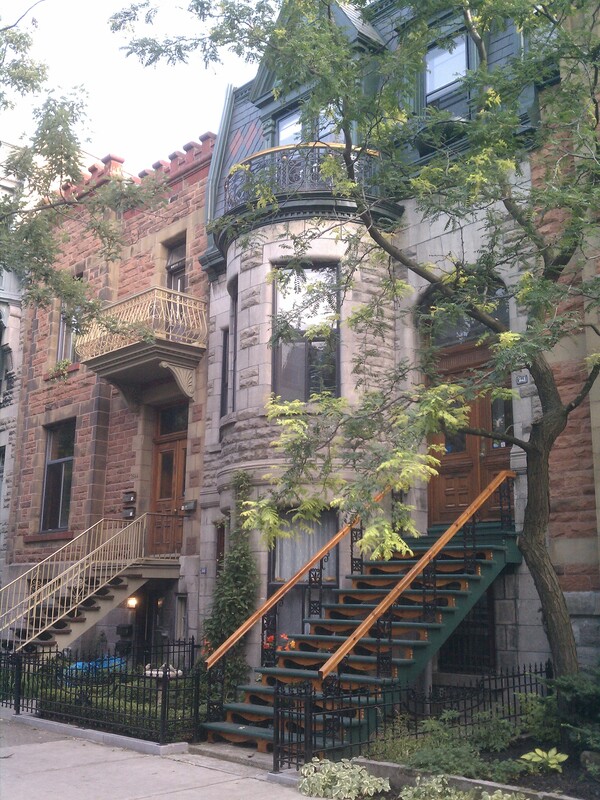 Next up will be a short tour of the bohemian St. Louis Square, my favorite little spot in MTL. 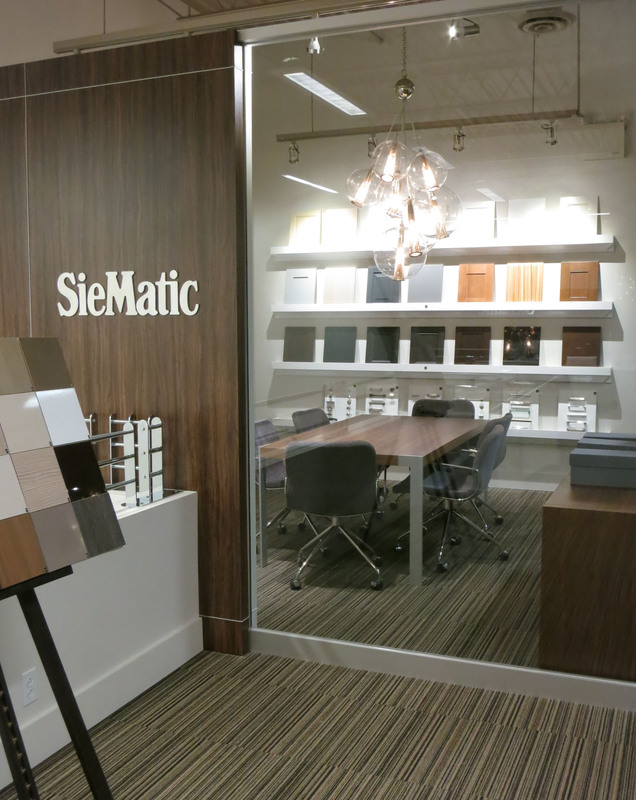 I am presently working on a project in Montreal, a new SieMatic studio across the island from the main city in Brossard. It is a good space with very smart owners and I’m sure the new business will be a success. I will post about the studio as the project comes together. 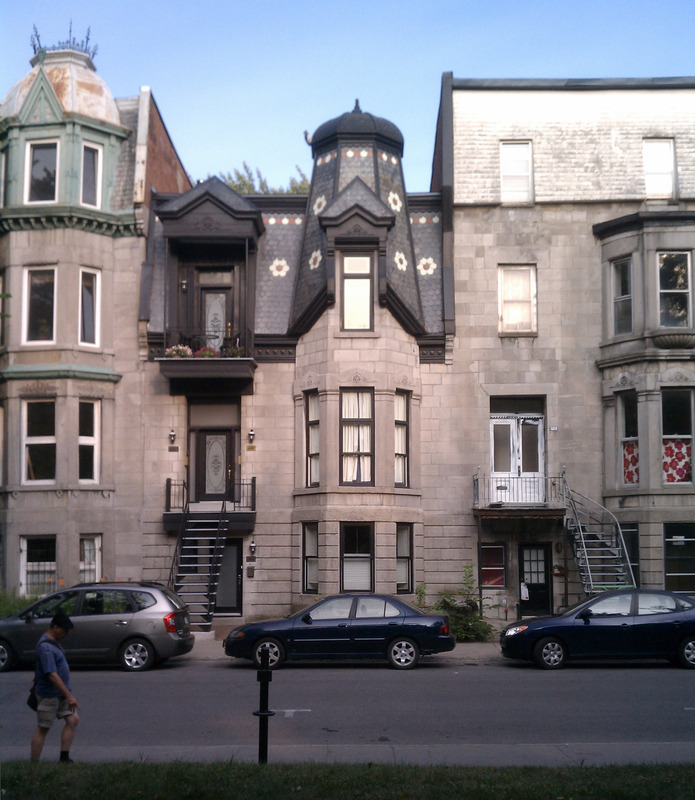 Since I had never been to Montreal before, I was excited to walk around – the flâneur that I am – and experience the fabric of the city. 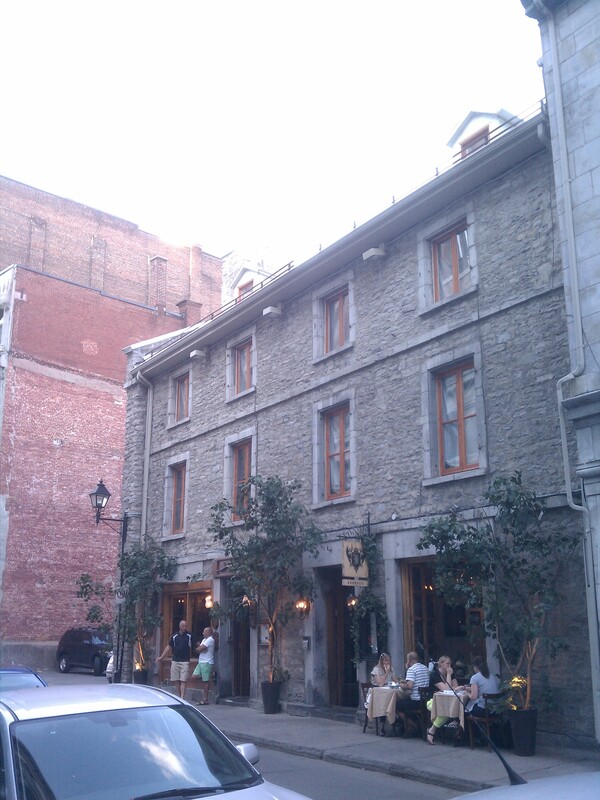 Following are some street views of Vieux Montréal – the old city. On the left: this little restaurant reminds me of a place in Barcelona. To the right, a curious little building. A Louer means “for rent”. The old city adjoins the lovely waterfront, the old port. 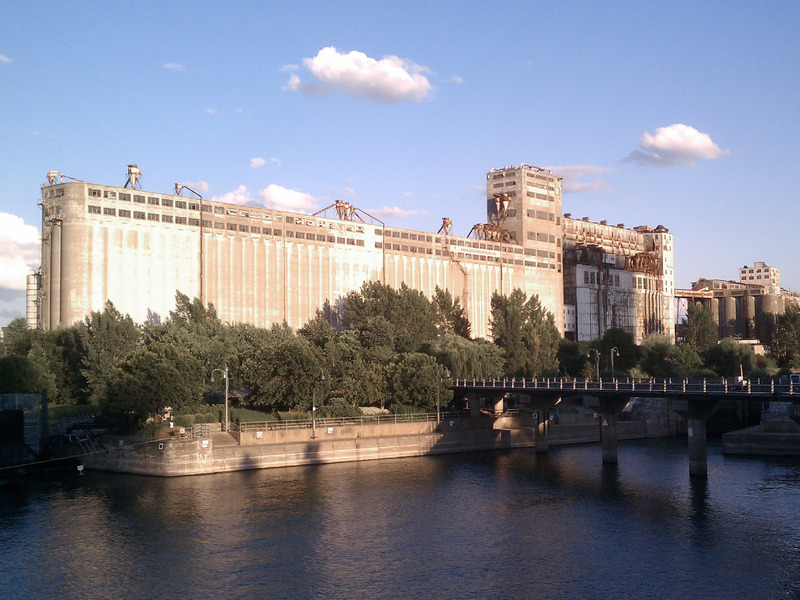 The city used to compete with New York City for shipping to the midwest; all ocean cargo headed up the St. Lawrence river needed to disembark at Montreal and go through the Lachine Canal. This era ended when the St. Lawrence seaway opened in the 1950’s, among other factors, and we are now left with an amazing still-life of industrial ruins. Directly across the waterway are two islands, which were developed around the time of Expo ’67. 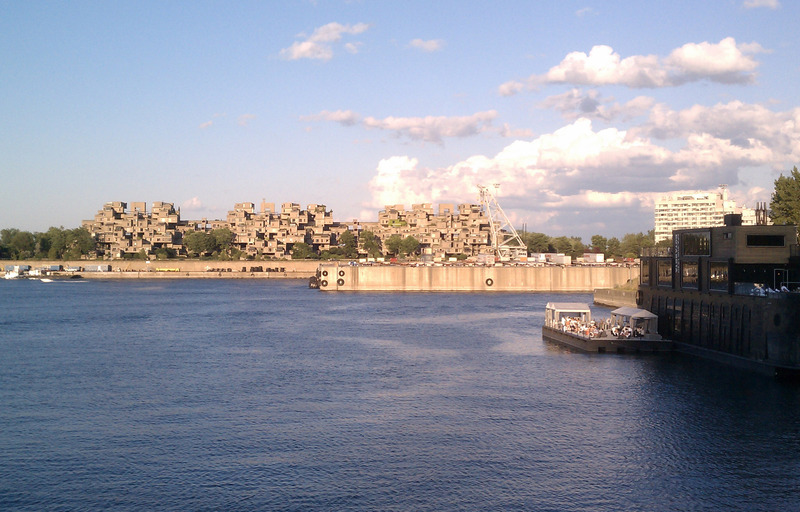 This is a view of the incredible housing complex Habitat 67, designed by Moshe Safdie. 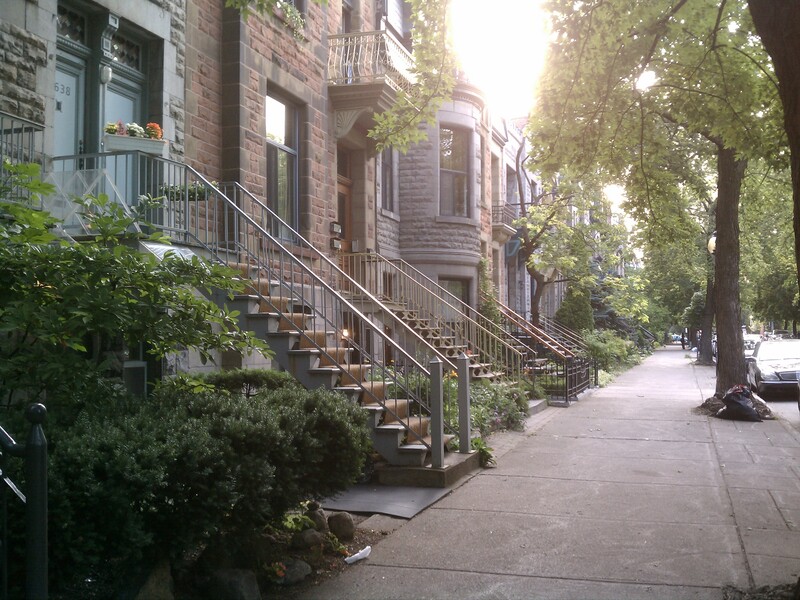 There is a wonderful feeling of summer outdoor activity in Montreal. There is a great bike path going right through this section of the city – bikers were whizzing by constantly. Lovers strolling, young families having a quiet picnic on the grass. Everything was so civilized. 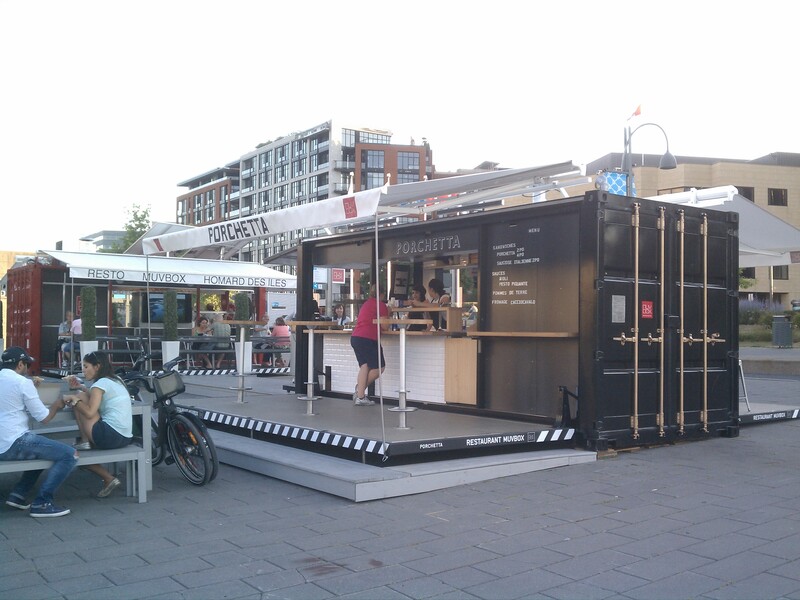 An outdoor bar and two “food trucks” were placed on the quay – I tried a pizza from one of these trucks; it was made fresh right there in front of my eyes – and it was quite good! It was getting dark pretty quick. I found a roof-top bar and relaxed with a drink among the sound of French conversation. 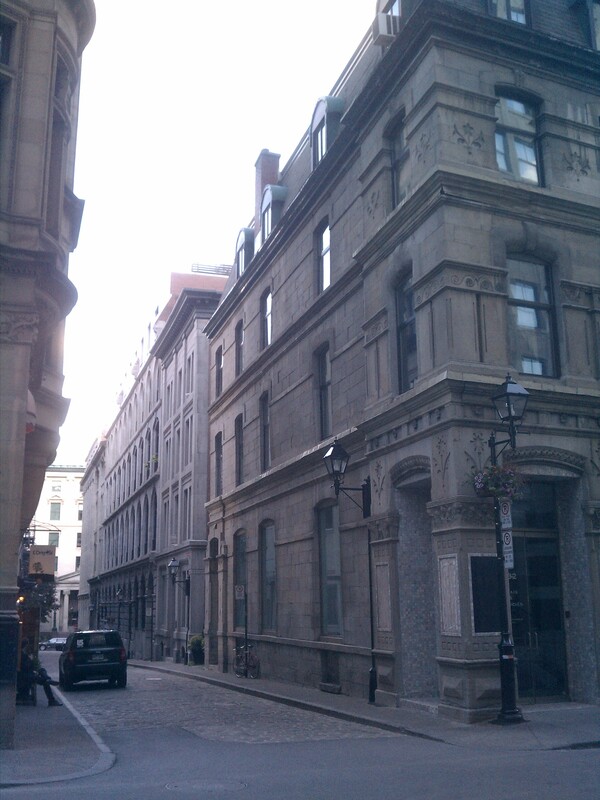 On my way to my hotel – a hip new building in total contrast to old Montreal – I walked through what I would discover is just one of many pedestrian-only streets. 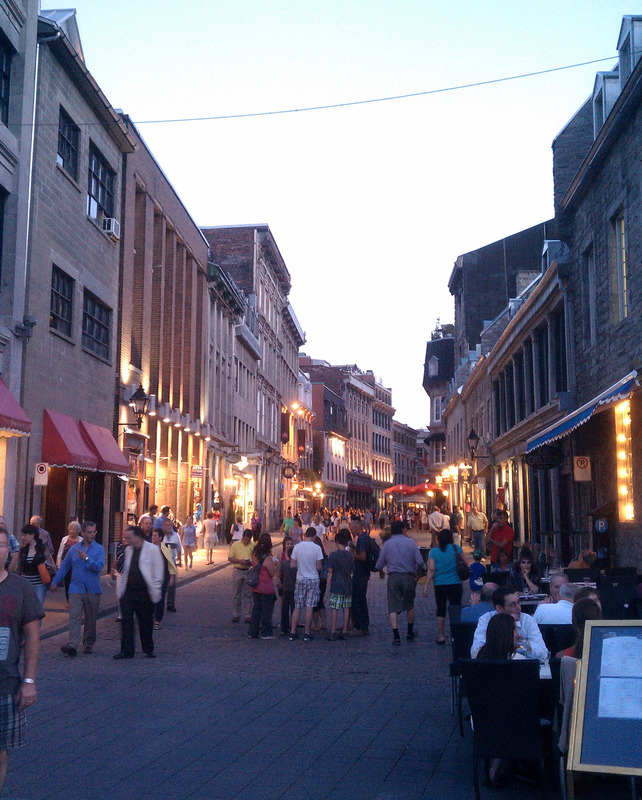 This could be mistaken for Quebec City; a bit touristy, and lots of souvenir shops. Still, lovely. 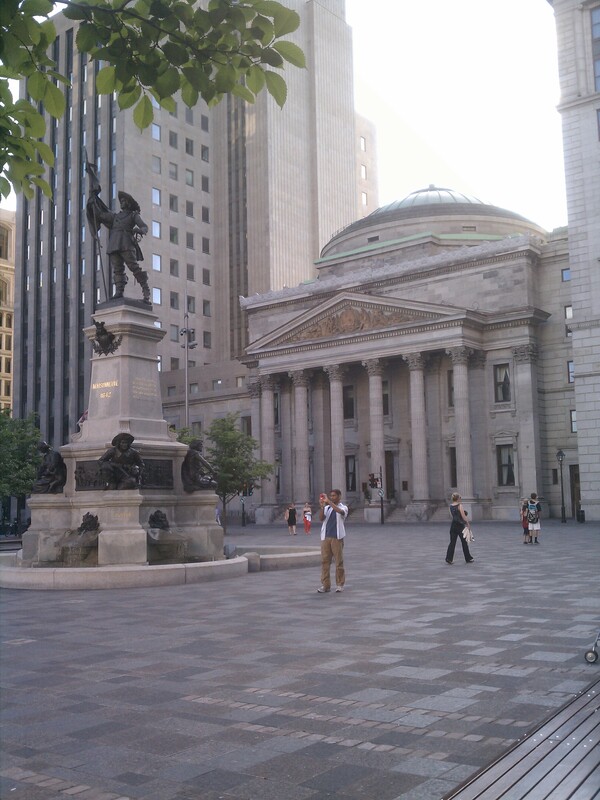 In future installments I will post reports of other walks I took in Montreal; the lovely Beaux Arts-era Golden Mile and my favorite spot I found, St. Louis Square.